After being handed a sweep by the St. Louis Cardinals and falling a game behind them in the NL Central standings, the Cincinnati Reds handed the Florida Marlins three straight defeats and placed themselves, once again, ahead of the Cardinals in first place. Now sixteen games above the .500 mark (67-51), the Reds are heading to the dreaded West Coast for nine consecutive road games. The first three games will be against the last place Snakes (47-72) at Chase Field in Arizona beginning on Tuesday. The Reds have not faced the Diamondbacks this season, but swept Arizona during last season's trip to Chase field and have a 5-1 record there in the last two seasons. Bronson Arroyo will be making his 25th start of the season against the D-backs on Tuesday night. Arroyo has not faired well against Arizona in the past. In six career starts, Arroyo has notched three losses and received just one win while posting a 5.23 ERA. Daniel Hudson will be making his fist career start against the Reds in just his fourth start for Arizona after being traded from the Chicago White Sox for Edwin Jackson on July 30. Hudson went 1-1 for Chicago this season in three starts, but has gone undefeated in his first three starts (22.2IP, 13H, 4ER, 17K, 1.59ERA) with his new team. In Edinson Volquez's only career start against the Arizona Diamondbacks on September 13, 2008, he pitched six innings and allowed two earned runs on five hits while striking out eight during a 3-2 Reds victory. Rodrigo Lopez has faced the Reds four times during his nine major league seasons (1-0, 6.32). Lopez is tied with Tampa Bay's James Shields for most homeruns allowed (28) in all of baseball. 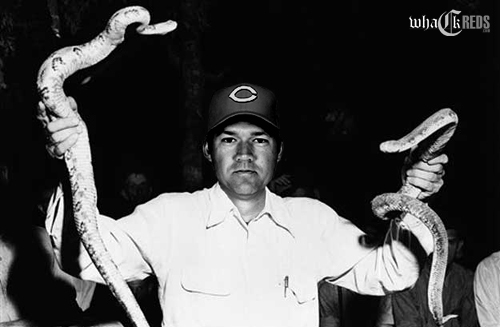 Since the Reds have not yet faced the Snakes this season, neither has rookie left-hander Travis Wood. Optioned to Louisville August 9th making room for Jim Edmonds on the Reds' roster, Wood will return to the Reds rotation on Thursday. During Wood's first eight major league starts this season (3-0 on the road), the Reds have won six, outscoring their opponents 52-18. Both being 1-0 defeats, the Reds have lost only two games this season with Wood on the mound. Joe Saunders was acquired by the Diamondbacks from the Anaheim Angels in the July 26, Dan Haren trade and will be making his first career start against the Cincinnati Reds on Thursday. Saunders was 6-10 in twenty starts for the Angels earlier this season and is 1-2 in four starts, so far in Arizona. During Saunders' past two starts against Washington and San Diego, he allowed ten runs on eighteen hits in twelve innings of work. "It's always a tough trip - but I believe in the law of averages," Dusty Baker said. "We're due to win some games out there and we're going to take it one day at a time."